The ISUS is a sensor used to measure concentrations of dissolved chemicals directly from their Ultraviolet Absorption Spectrum (Johnson and Coletti, 2002). A variety of chemicals absorb light in the UV and each of these chemicals has a unique absorption spectrum. We can determine the concentration of these chemicals directly, with no chemical manipulation, by measuring the absorption spectrum of seawater in the UV and then deconvolving the spectra to yield the concentration of each component. The ISUS is now commercially available from Satlantic, Inc.
ISUS has been used to determine nitrate concentrations while deployed on CTD/Rosette profilers, undulating towed vehicles such as a SeaSoar or SeaSciences Acrobat, and on deep-sea moorings. It has also been used to measure sulfide flux from cold seeps in Monterey Bay while deployed on the Remotely Operated Vehicle Ventana. 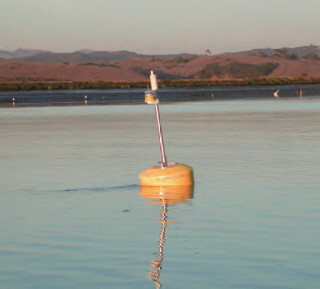 Real-time nitrate data from an ISUS deployed on the MBARI M1 mooring is also available. There are two processors running for this data: one written by Luke Coletti (CGI application ) that includes interactive fitting of nitrate and can also be used to compare nitrate concentrations to other properties such as temperature, fluorescence and CO2; and one written by Ken Johnson (Visual Basic script) that compares the real-time data to historical observations in Monterey Bay. To learn more about ISUS read our paper in Deep-Sea Research and check Luke Coletti’s home page for several posters that have been written about ISUS. To learn about applications of ISUS to studies of phytoplankton primary production, we have another paper in Deep-Sea Research. ISUS was developed with support from the National Science Foundation and from MBARI.